The top Tarleton State University Departments on Twitter will be honored at the 6th Annual Texas Social Media Conference in Fort Worth, Texas on Friday, November 4, 2016. Fort Worth, Texas - The Texas Social Media Research Institute (@TSMRI) will present statewide social media awards (for the top Tarleton State University Deparments on Twitter) at the 6th Annual Social Media Conference (#TXSocialMedia) in Fort Worth, Texas on Friday, November 4, 2016. 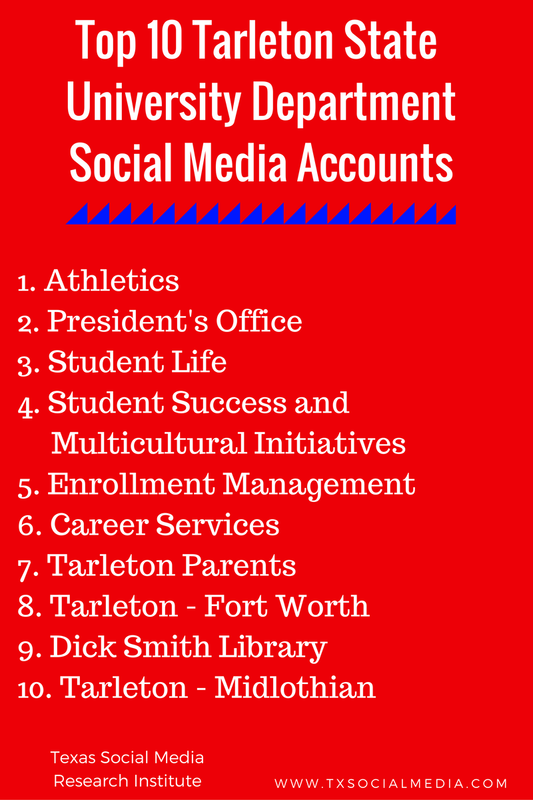 The following Tarleton State University Departments will be honored at the #TXSocialMedia Conference. 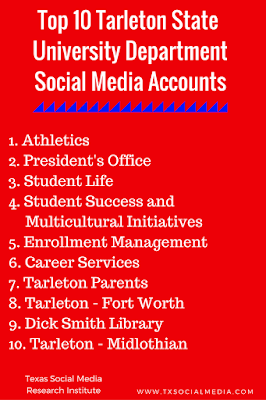 The top Tarleton State University Department Twitter accounts will be honored at the 6th Annual Social Media Conference in Fort Worth, Texas, at Tarleton State University Fort Worth on Friday, November 4, 2016. To register for the conference, please visit http://www.txsocialmedia.org/. Representatives from the “Top Tarleton State University Departments on Twitter” are encouraged to contact texassocialmediaresearch@gmail.com for a special registration code. The following criteria were utilized to determine the top Tarleton State University Departments: included on the “Tarleton State University” Tarleton on Social Media webpage, Klout (influencer) score of at least 35 (according to Klout Chrome extension), and number of followers. For more information about Klout scores, please visit http://www.klout.com/.